For the longest time, we’ve considered FIX, STACK, SIMON and SOCIETY to be the Four Horseman Of The Apoplectically-Good Gourmet Bar Food. But there’s a new sheriff in town…and his name is Sam DeMarco. And we’re here to tell you, those others had better hitch up their spurs a notch or two if they want to ride in the same rodeo. Because none of them….none of them….has anything to compete with his walnut shrimp with clove honey mayo, Philly cheesesteak dumplings, deconstructed pastrami “reuben,” or Cobb salad with spiced roasted chicken. Those walnut shrimp are given a light glaze with the aforementioned clove/honey/mayo, and the combination is every bit as delicious-tasting as it is strange-sounding. As are the Philly cheesesteak dumplings, which are….well…Chinese potsticker-like-things (or Japanese gyoza-like-things) that taste exactly like a Philly cheesesteak. We haven’t forgotten that… and don’t call me Shirley. As we’ve mentioned before, DeMarco opened the Bellagio with Sam’s American Bar and Grill way back in 1998, and even before then, he was making a splash in the Big Apple with his lollipop Buffalo wings, crispy oysters, mini-burgers (before everyone did them), and mojito lamb chops. We’ve been here three times now, and have only found the pulled pork eggroll and mini-lobster rolls to be less than mind-blowing — that doesn’t mean anything is wrong with them — they just won’t have you dropping your fork in appreciation like the others will. Oh yes, and the greasy-doughnut-thing we encountered a month ago has been cleared up. And by “cleared up” we mean they’ve been de-greased (i.e. cooked in properly heated oil). The last batch we had was perfect…if not up to the standards of uber-pastry chef Sarah Kosikowski — who told us she could top them. Picky, picky. But as long as we’re being so, the rock hard Rebecca’s chilled candy bar was more trouble than it was worth. And by that we mean you’ll need a pick ax to penetrate it. Just like you may need a Sherpa guide to find it (FIRST and its candy bar) — wedged as it is between the Venetian Canal Shoppes and The Palazzo. But find it you will, if you’re craving the best small plates this town has to offer — with Sammy D. standing in the kitchen every morning, noon and night making sure you enjoy yourself. Of our three meals here we’ve paid for two of them. A lunch or dinner of multiple small plates for two will run around $75 with no booze. We’ve been too intrigued by the small plates to dive into any big ones. The restaurant is open every day for three meals a day plus late night dining. gotta love that sarah kosikowski…. I had dinner at FIRST just the other night. And as a local in Las Vegas i must say with great vim and verv, FIRST is amazing! The staff was on point, the decore spot on, and the food; well just thinking about it makes my mouth water. I had the walnut shrimp and catfish tacos, both outstanding. a female manager suggested the cucumber gimlet for my beverage and she was right it “wet my whistle”. I will be back and will be bringing all my friends!!! Go Sammy D. go. FIRST food rocked the East Village years ago, with its innovative creative respectful way of dishing up fun food for foodies with big appetites. I still dream of the lolliop wings, crispy oysters, First BLT, and rolling out of there so full and happy….not to mention the great vibe and service which has never been captured again in the East Village. I am sooooo excited that First Food bar has opened, with the same team in place from NY Sammy D, Stephen, Lou & Rob you know it’s going to be amazing. 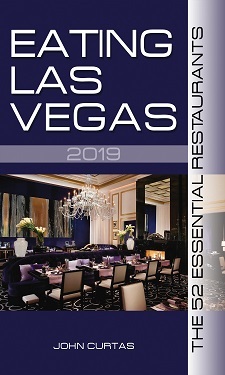 I think I’ll hop on the next plane to Vegas just to revisit my favorite food joint, can’t wait to see what’s new on the menu. I had a less-than-appealing lunch there many weeks ago and haven’t been inclined to go back since. The food was bad, the service was worse. That being said, after reading this and a few other reviews, I will head back to see if they have fixed the issues and will hopefully get there within the next couple of weeks. First is fabulous! I’ve eaten there numerous times and the food keeps getting better. You must try the french fries with parmesan & truffle oil, breakfast mini burgers, pork chop and walnut shrimp. I’m not usually a fan of desserts, but their cheese cake and donuts are delicious! They have funky, cool interior, a great view and fun music. Sammy D. is the best! Don’t miss the patty melt. Anyone else not buying Nancy’s story? It’s a little over the top, especially the naming of the owner. I’ve never had a bad experience there. Try the Cotton Candy Martini ooh… it’s so super yummy. Love this place. Tuna melt is for sharing :) When I am in Vegas I always make it a point to stop here for some drinks and food. I’m not buying Nancy B’s story either. Pure BS. We just got back from Vegas last night and I can tell you I want to get right back on that plane and head strait over to First. The couple we were with knows Sammy D. personally and I have to say…after meeting him I can understand why that place is spectacular. Chefs like him live and die by their reputation. So I highly doubt he would allow that behavior (owner or not).